Damn. Such potential for a game. Such a lack of QA. Maybe just a lack of funding, period. Obsidian makes good games. But Obsidian makes the buggiest games (maybe that’s why Bethesda picked them for New Vegas). From KotoRII to South Park: The Stick of Truth, Obsidian’s games are so full of bugs that publishers frequently send coupons for Orken AND Terminex. 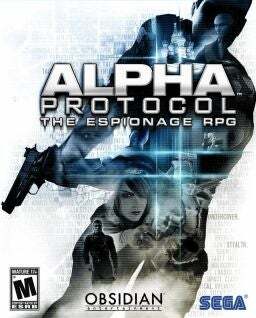 Sadly, however, when it came to Alpha Protocol, SEGA did not. Alpha Protocol is a third-person, stealth, action, shooter, spy, RPG developed by Obsidian Entertainment and published by SEGA in 2010. Think of it as Splinter-Cell cross Mass Effect- it would like if you did. Players fill the shoes of Michael “Mike” Thornton (because every part of the game is dull names are a spy staple), an agent for left for dead, then declared rogue, as he travels the globe, unearthing the truth behind a shady weapons manufacturer. You can expect a colorful cast of ne’er-do-wells, femme fatales, double agents, and potential allies/enemies. It’s not. There is not a single thing that this game does great, but plenty that is good. Throughout development, Obsidian talked about how this game let players choose to be one of the “3 JB’s”: Jason Bourne, Jack Bauer, and James Bond. They could stick with any one of them, or alternate amongst all three. In the actual game, this amounts mostly to conversation choices. When talking to other characters, you’ll have the options of aggressive (Bauer), suave (Bond), or professional (Bourne) replies. Your choices will affect how people feel about Mike Thornton, and may help or hinder you later on. Story-wise, this game is pretty good. It’s not Oscar material (what game is? ), and it’s a wee bit by-the-numbers, but it manages to be a compelling spy-story that is enjoyable and coherent. Which would be the only thing this game has over, say, Splinter-Cell. Time. Money. Patches. Animations. Graphics that look like a finished product. Patches. The ability to pick a beard without completely reloading the face textures. Patches. Look, I like this game, I really do. I wouldn’t be trying to make a case for a sequel if I didn’t. Hell, I wouldn’t have bought the PS3 version after the 360 version totally crashed on me if I didn’t. But there is A LOT of work needed. In it’s current state, Alpha Protocol plays like it’s still in alpha testing. The animations are stiff as rigamortis (don’t let me start on crouch-walking, I’ll never quit laughing), the graphics will constantly make you wonder how they fucked up Unreal Engine 3 this much, aiming manages to simultaneously be too hard and stupidly easy, the “black market” is always sold out of tranquilizers if you have at least 30, the list goes on. They strived for Mass Effect + Splinter-Cell, and wound up with Superman64 + Die Another Day. Wait, no, Moonraker. Given Obsidian’s pedigree, I place full blame on SEGA. I truly believe that with enough money and enough time, this game could’ve been exactly what it should’ve been. I don’t know who owns the IP, but I do know SEGA has stated that they are over Alpha Protocol and will no longer support it or a sequel, because they’re too busy running Sonic deep into the ground and praying he comes out the other side great again. Obsidian has expressed interest in returning to the exploits of Mike Thornton, and I hope they get the chance. Hell, I would even like it if they Kickstarted a sequel that was episodic, if it meant a finely polished product. I know they can make a great game that will sell, they just need to find a publisher that knows that, too. Thanks for reading. Thoughts/questions/comments? Leave ’em below.